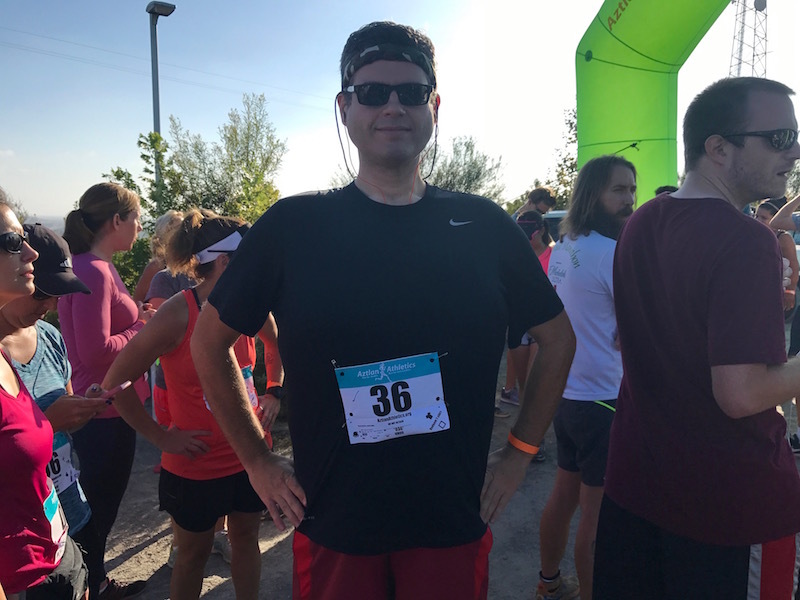 This 5K is All Hills and Stairs (2017 Conquer the Overlook Race Recap) | Keep It Up, David! You can see the Los Angeles skyline in the upper right corner! I’m standing on top of a big hill. It’s at a park called the Baldwin Hills Scenic Overlook. 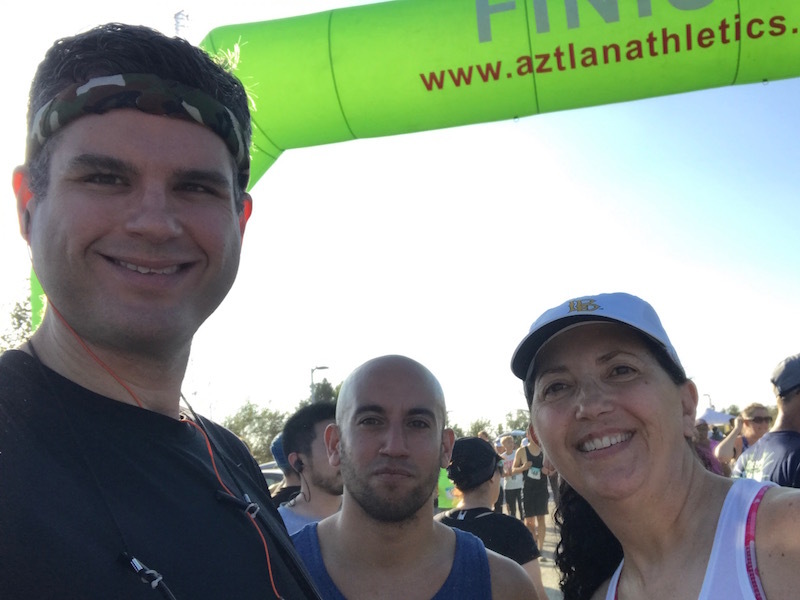 It’s the venue for the hardest 5K race I’ve ever done – and this was my third consecutive year doing it. Conquer the Overlook is the name of the 5K, and the start line is at the top. The course takes you down switchbacks to the base of the hill, and then back up the hill. There’s a little detour around some baseball diamonds (the only flat part of the course), but you eventually get back up to the top… but then you run back down a second time. And then it’s time for the stairs. Yup, you heard me, STAIRS. 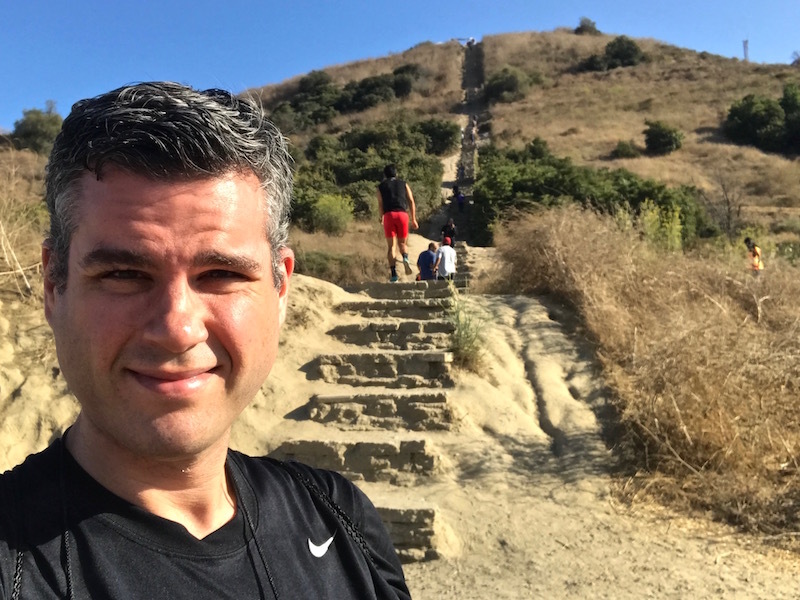 After three of miles of running up and down hills, you have to face a 282-step stairway that takes you back up to the top. The stairs are the final part of the 5K course – the finish line is at the top. I climbed the stairs when I arrived. I needed to get to the top anyway, since that’s where the race started, but I also wanted a reminder of what these stairs are like, because I haven’t been here since last year’s race. And I was quickly reminded of how difficult they are! 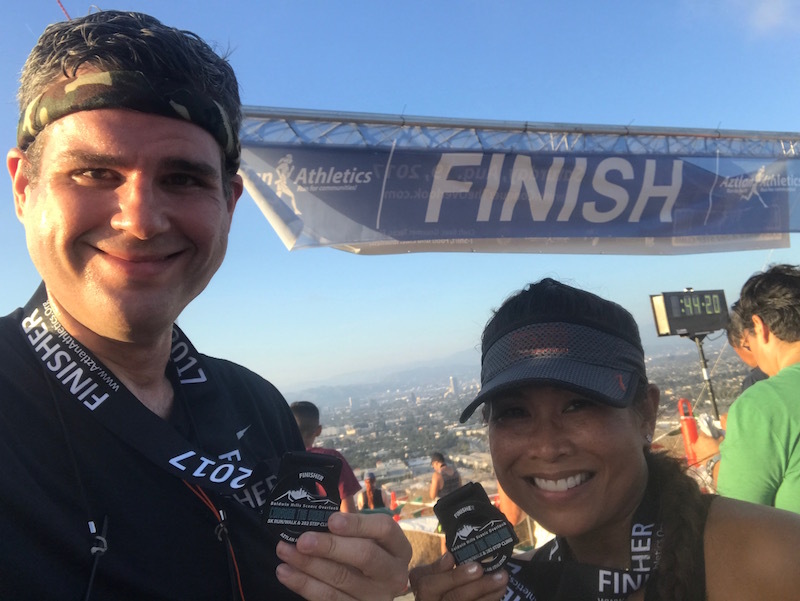 There was plenty of time to relax, stretch and focus at the top, and plus I got to hang out with my friends Alberto and Mary at the start line. Crooked bibs bug me and I’m annoyed I didn’t straighten this one out. I totally lied in that past paragraph: I’m 38. This race is grueling. But I was just there to have some fun, and get in a challenging workout. 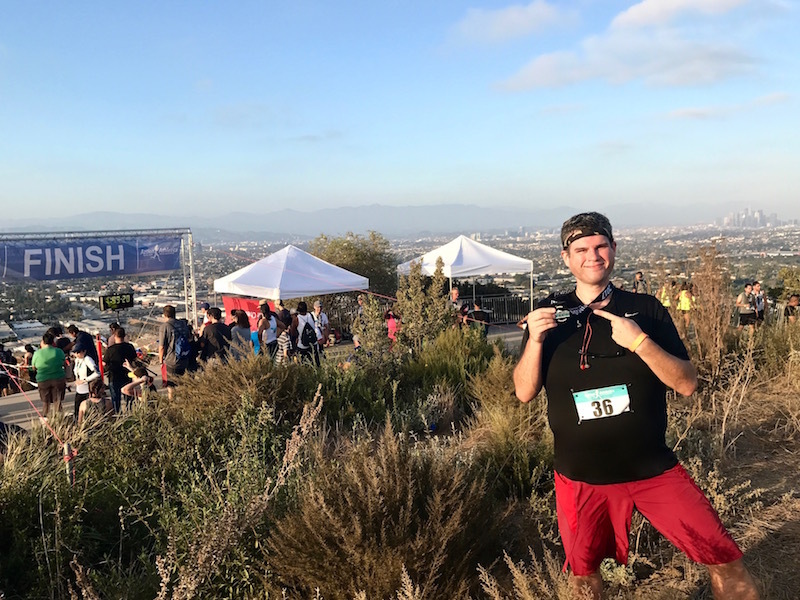 The race was on a Saturday, and it wasn’t until the Wednesday or Thursday beforehand that I finally felt out of the woods from my poison oak outbreak (that I got on this hike). Even though I stayed active while I was covered in rashes, the poison oak took its toll, and I didn’t feel very prepared for this race. I figured a PR was out the question. I didn’t even look up my times from the past two years beforehand – I didn’t really care. I was just there for funsies. During the actual race, though, ‘fun’ wasn’t really on my mind. It’s so goddamned hard! Running downhill is easier than running uphill, but it’s not easy. Plus, the downhill trails were narrow and bumpy, so I was constantly watching the trail and figuring out where I was going to place my feet. 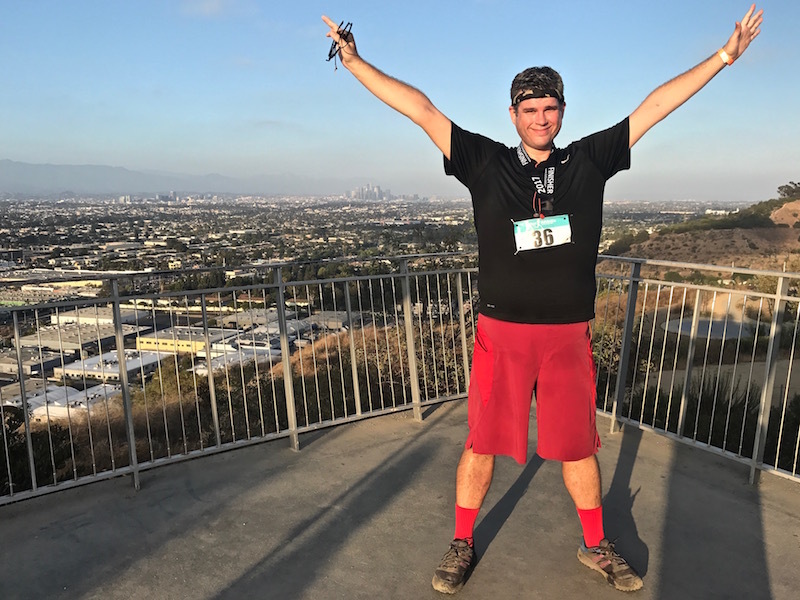 There was a constant stream of runners that passed me on the downhill part, and that made me look forward to the uphill part, because my years of stair racing come in handy then – and it’s when I do my passing. It felt good to pass those that passed me earlier, and it really felt good to excel during the most challenging part of the course. The runners were more spread out during the second descent, so I wasn’t passed as often, but man, was I tired. And achy. I remember looking up from my feet, and seeing a volunteer pointing at the stairs, and then making that final turn, and seeing those 282 steps between me and the finish line. I felt a mixture of relief and dread. I was so close to finishing… as soon as I scaled this brutally challenging stairway. 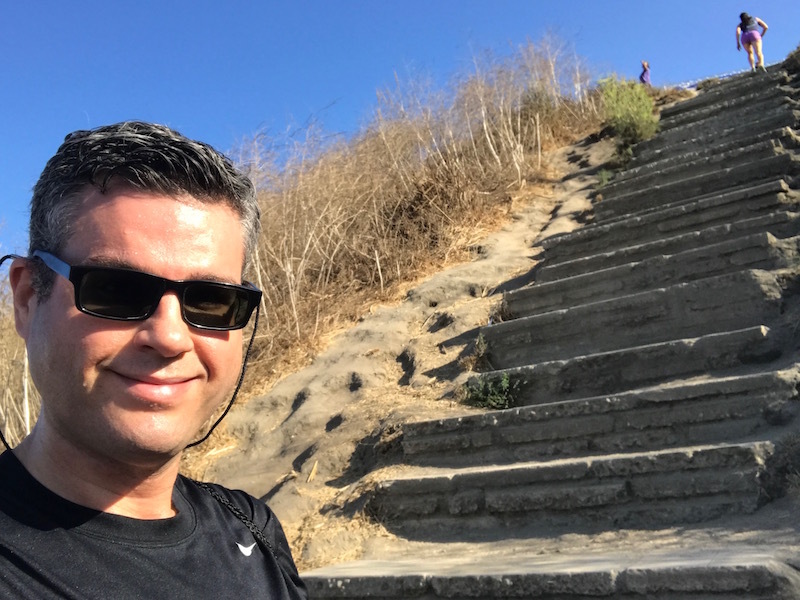 I felt like I was moving slowly, but I was moving faster than many, because I passed at least a half dozen people on the stairs. Alberto, who had already finished, cheered me on near the end, and I managed to pass one final woman a few feet from the finish line. They handed me my finisher’s medal and I couldn’t wait to sit down. Every part of me was throbbing with pain and exhaustion. 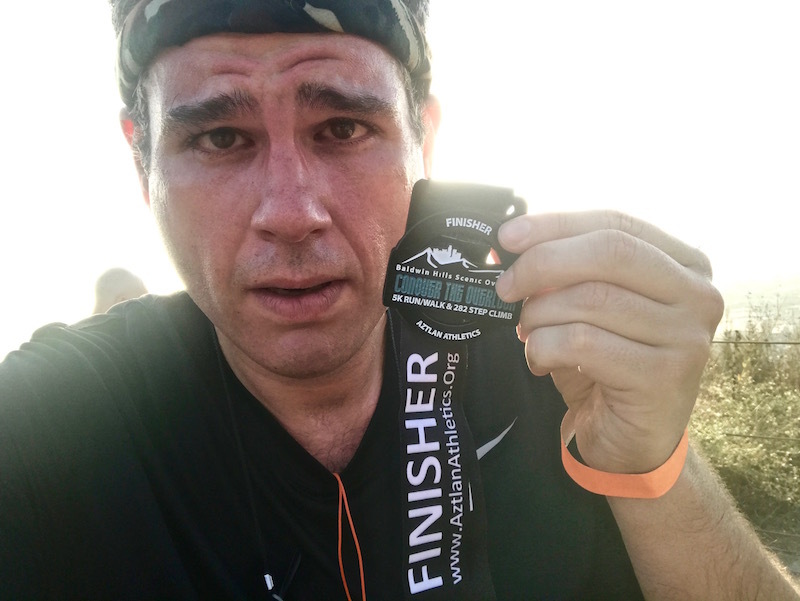 I had timed myself – and I finished in 39:08. My official time was 39:14. The six-second discrepancy is because they started their clock when the gun sounded, and I started my clock when I crossed the start line. It took me six seconds to get across the start line, because I was a little ways back in the crowd. It wasn’t until I got back to my car, after the event, that I looked up my previous times and realized how well I had done. I had anticipated correctly that I wasn’t going to get a PR, but I was only 26 seconds slower than my fastest time from two years ago! And I was 1 minute, 35 seconds faster than last year! WOWZA – what an exciting surprise! And that, folks, is what having an excellent base fitness level can do. I wasn’t feeling in tip-top shape, but I’m still pretty strong and I’m still pretty fast. And that’s a pretty awesome feeling! This entry was posted on Monday, August 21st, 2017 at 1:15 am and is filed under Uncategorized. You can follow any responses to this entry through the RSS 2.0 feed. You can leave a response, or trackback from your own site.